In Ensuès-la-Redonne, the seaside offer many creeks and beautiful calanques. In Méjean you can find a pebble beach. The village is protected by the Coastal Protection, 80% being covered with scrubland. 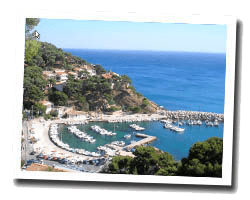 With its nice fishing port, it is a destination for authentic seaside holidays in Provence. In Ensuès-la-Redonne enjoy a seaview holiday rental. Holiday house 32 m2. Terrace with outdoor furniture and barbecue. View of the sea and the rocky coast. 50 m from the sea, in a quiet and wild calanque of the "côte bleue": "la Madrague de Gignac", Facing Marseille and isles. Between Marseille and Martigues close to Carry le Rouet in Provence. 2 Bedroom(s), 1 double bed(s). short stays possibility. Final cleaning : 35 €. 7 Bedroom(s), 4 double bed(s). Final cleaning : 180 €. 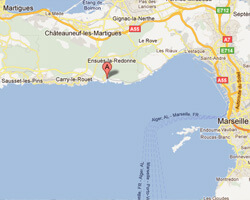 Villa of 110m2 for 8 persons, located in Ensues la Redonne with a magnificent view of the sea. 4 Bedroom(s), 4 double bed(s). Final cleaning : 100 €. Price from 1750 € to 2200 €. Ideally located, very quiet and exceptional view of the harbor of Marseille and its islands. Large terrace (25m2) and pergola. Price from 500 € to 850 €. 3 rooms house 120 m2. Terrace, garden with outdoor furniture and barbecue. Nice view of the sea and the rocky coast. Direct access to the sea. Villa 115 m2. Terrace, garden with outdoor furniture, deck chairs and barbecue. View of the sea and the rocky coast. 6 Bedroom(s), 5 double bed(s). short stays possibility. Final cleaning : 95 €.